Did you know that the United States Postal Service handles nearly 500 million pieces of mail each day? If you’re planning a wedding, the last thing you want to do is worry about your invitations arriving on time. Weddings are stressful enough, but some couples make things harder for themselves without realizing. 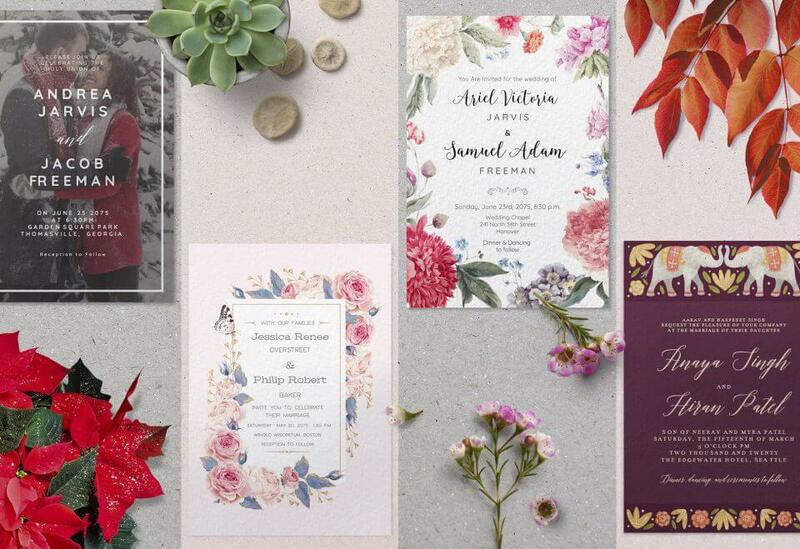 Whether you don’t give yourself enough time to assemble, you send invitations too late, or you have to hunt people down for RSVPs, navigating the world of wedding invitations can be tricky. Want to make wedding planning stress-free? Read on for everything you need to know about when to send wedding invitations. How Early Do You Send Wedding Invitations? If you send wedding invitations too soon, people may forget about the event or feel unable to commit too far in advance. If you send them too late, you could cause a lot of stress for guests who have to scramble to accommodate your plans. If the wedding is local, then the best time to send your invitations is two months ahead. You do have a little bit of wiggle room, though. In order to be courteous to your guests, do not send out wedding invitations any later than six weeks ahead of the event. There are many benefits of hosting a destination wedding. This tactic is a great way to make the wedding an intimate gathering of your closest loved ones. If you don’t have the heart to trim your guest list, getting married somewhere far away will deter casual acquaintances from attending. Everyone you know can feel good about getting invited, but you’ll only be surrounded by your best friends on your special day. Although your loved ones would do anything for you, it’s still polite to give them plenty of time to prepare for your destination wedding. If you’ve ever tried to make travel plans last minute, you know how expensive plane tickets and hotel rooms cost. For destination weddings, it’s best to give your guests at least three months’ notice before your special day. This gives them plenty of time to request days off from work if necessary and book everything at a reasonable price. What about Inviting Out-of-Town and Overseas Guests? If you have any loved ones who live out of town or abroad, then your wedding will be considered a destination wedding in their eyes. Whether you’re staying local or taking your celebration elsewhere, the same three month rule applies. However, if you have a solid date and location in mind ahead of time, you can always inform these guests as soon as you have concrete plans. They’ll definitely appreciate having the opportunity to browse travel deals to watch for any bargains. Some airlines list flights as far ahead as one year. The more time people have to prepare their travel plans, the less expensive their bill will be. This tip can also help you plan an inexpensive honeymoon if you have a dream destination and dates in mind. Many people get confused about the purpose of save-the-date cards. If you know the exact date of your wedding festivities but you don’t have a location set, a save-the-date can ensure your guests keep that date free. Some wedding venues have a long wait list that can set you back a few months or even a year. Did you know that one venue in New York is booked for the next ten years? During your planning, you’ll likely have to negotiate with several wedding venues before you settle on a location. When you send your wedding invitations, you need to include all the important details like the address. Save-the-dates are a helpful tool because guests can pencil you in on their calendars before you even know where the ceremony will take place. If you’re worried about peak wedding seasons, it’s helpful to know that most couples choose to get married in the warmer months. 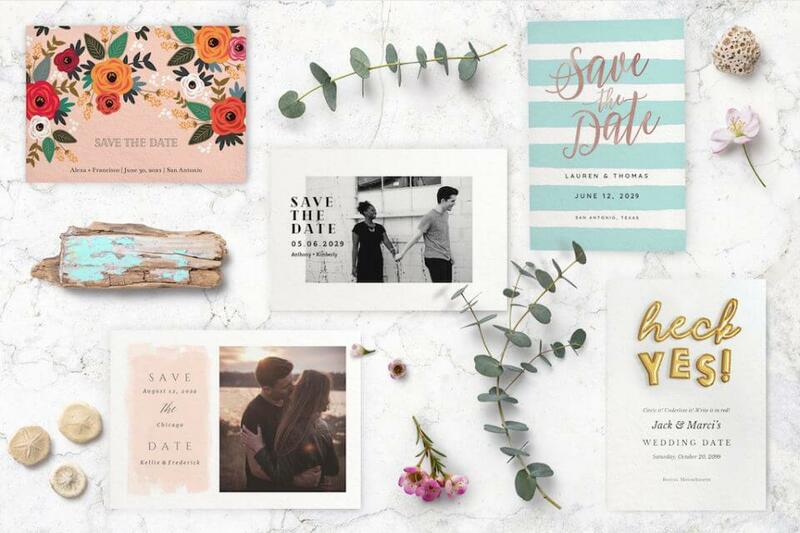 In order to avoid losing guests to other commitments, you should definitely consider sending save-the-dates if you’re also planning a summer wedding. Wedding invitations can cost a lot more than you’d expect. Aside from purchasing enough cards and envelopes for your guest list, you also have to worry about postage. If you have a lot of friends scattered around the world, these letters can rack up your bill even faster. Thankfully, there are plenty of ways you can save money on your wedding invitations. One of the best ways to trim your expenses is to create your own invitations. Not only is this approach more affordable, but the results are also more personal and special. Skip the fancy bridal shops that have booklets of expensive templates. You can be in control of every design element to ensure you love how your cards look. Many couples frame their wedding invitations or keep them in a photo album to remember their special day. Making your invitations together as a team is a fun way to create something both of you will cherish for the rest of your lives. These customizable invitations give you the option to send in a variety of ways. You can print them from home or at your local print shop, email them online with RSVP and full event management system, or save them as a high-quality image to share on social media or other messaging apps. The rest of the world is digital now, which means it’s no longer tacky to send an online invitation. If you do decide to ditch mail altogether, it’s another great way you can save money. Another benefit of sending your invitations over email with RSVP services is that you’re much more likely to get your responses on time. Since an answer is only a click away, people won’t have to bother with sending their RSVP through the post office. If you have your heart set on mailed invitations, then you still have a few options to explore. USPS is most people’s first choice for sending their mail. However, you can and should look into other carrier services like UPS to see if you can find a better deal. Don’t want to pay premium prices for the fastest delivery services? That’s okay. As long as you factor in shipping speeds when you drop off your letters, you can save money and still make sure every guest has their invitation two or three months in advance. 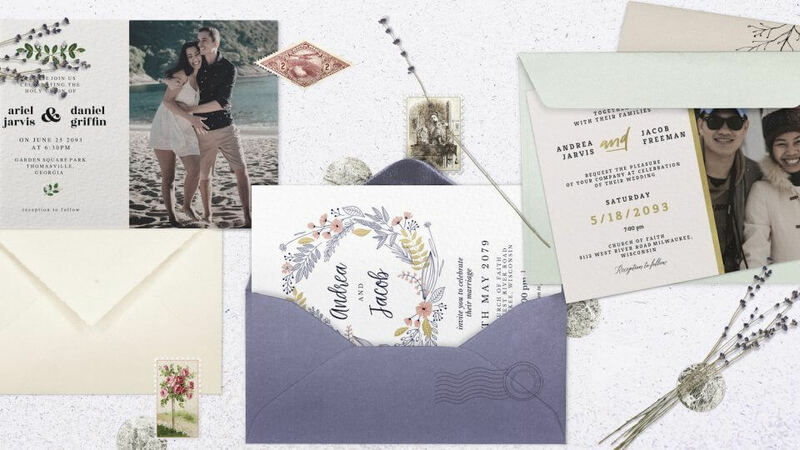 Receiving mail is fun for everyone, but when it comes to sending wedding invitations, the process can cause a lot of headaches. Addressing and sealing each envelope can take a lot longer than you anticipated. Make sure you give yourself an entire weekend to get this chore done so you don’t have to rush to meet the mailing deadline. If you can recruit a few friends to form an assembly line, the job can get done much faster. To make your job easier, it’s worth investing in a personalized stamp that has your mailing address. With this tool, you can save yourself from hand cramps after writing out the return address on each envelope. Another helpful tool you can use is your printer. Lots of modern printers allow you to choose custom page sizes for printing. If you create the envelope’s dimensions on your word processor, you could make your printer do all the work instead. If money isn’t a big concern, you could also hire a calligrapher to handle your invitations. This option is great for couples who want a handwritten, elegant product but don’t want to invest time doing the job themselves. When Should You Collect Wedding RSVPs? As challenging as sending your wedding invitations can be, you can’t relax until you get all your RSVPs back. RSVPs are crucial for your wedding plans because having an accurate headcount can make a huge impact on catering costs and other expenses. Lots of people understand how difficult wedding planning can be, so they’ll be sympathetic and return their RSVPs as soon as possible. However, you should include a deadline to respond on your wedding invitation. If your guest list is small, you can get away with setting the deadline two or three weeks ahead of the wedding. However, larger guest lists create more uncertainties. To be on the safe side, one month’s notice is the perfect compromise to help guests figure out their own schedule and allow you to notify your caterer and venue. You shouldn’t have to feel shy about hunting RSVPs down if people miss the deadline. If you provide a deadline on the invitation and others ignore it, don’t hesitate to give them a call and get a definitive answer. Ready to Create Your Perfect Wedding Invitations? Now that you know when to send wedding invitations and how to avoid common mistakes, your wedding planning can be much less stressful. If you’re ready to start designing your perfect invitations, Greetings Island would love to help you create beautiful, custom cards. Check out our wedding invitation collection & save the date cards to find your dream wedding invitations template. When you’re ready to send thank you notes, we have lots of those to choose from as well.